Expert testimony (opinions) – very important testimony in construction disputes. Whether it is a delay claim, an inefficiency claim, a defect claim, etc., expert testimony plays an invaluable role in construction disputes. Construction attorneys work closely with expert witnesses to ensure that an expert helps render an opinion to support their client’s burden of proof (including damages) or an affirmative defense. Recently, the Florida Supreme Court ruled that the Frye test governs the admissibility of expert testimony in Florida State courts. Notably, this was the test used until circa 2013 until the Florida Legislature modified Florida’s Evidence Code to require the Daubert test to apply to determine the admissibility of expert testimony. The Daubert test is the test used in federal courts and, quite frankly, is a more rigorous standard/test. For more information on the Frye and Daubert test, please check out this article that I wrote to summarize Florida’s transition back to the Frye test. In any event, this transition back to the Frye test can be both good and bad depending on who you represent in a Florida State court action and the expert opinion you are looking to introduce. Expert witnesses are an integral part of construction disputes. An expert assists a party in proving or disproving liability or damages. In construction disputes, an expert could be used relating to a construction or design defect, a delay, an inefficiency, the standard of care, building code violations, the repair protocol, etc. 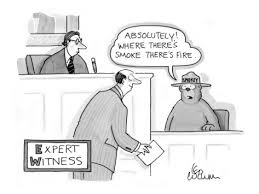 Irrespective of the basis for retaining an expert, oftentimes the expert generates a report with his/her opinions (and documentation relied on to form those opinions), is deposed, and, if the case proceeds to trial, is relied on to provide expert opinion testimony. Recently, I wrote an article about the Daubert test which is a court’s gatekeeping test to determine whether the expert opinion testimony is admissible. Parties utilizing experts in construction disputes need to understand this Daubert test. Please take a look at this article to familiarize yourself with Daubert to ensure you are engaging and preparing the right expert. Additionally, I wrote another article on expert opinion testimony including the standard of appellate review if a court strike’s expert opinion testimony or allows an expert to testify subject to an objection. Please take a look at this article because it is common for a party prior to trial to move to strike an opposing expert or portions of that expert’s opinion testimony.